We are a leading Manufacturer of steel galvanised roofing profile from Mumbai, India. Steel Galvanised Roofing Profile offered features durable and long lasting construction finish and can be made available in different options including in form of steel coil, sheets/plates as well as in corrugated finish. 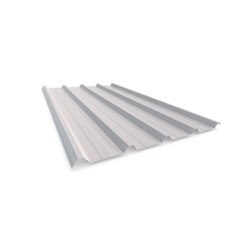 With choice of galvanized surface treatment, these roofing profiles are also light in weight as well as bear high finish strength. Some of its features include superior corrosion resistance, high-strength finish, provides for easy-installation support, applicability in areas like steel structure workshop, transportation; choice of different widths from 600mm to 900mm, can be offered as per different industry standards like JIS, ASTM and others. Looking for Steel Galvanised Roofing Profile ?